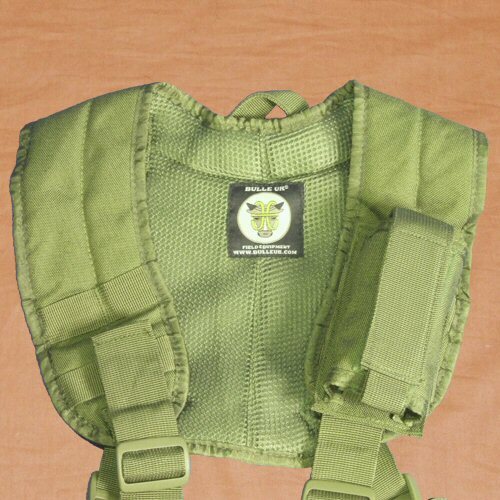 Bulle designed and produced MLE (Multi-level Load Equipment) harness in olive and brown. 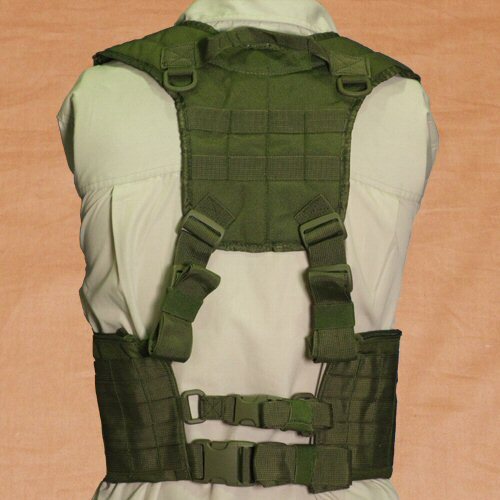 This harness provides a skeletal MOLLE base for excellent ventilation in hot weather, and may be worn high on the chest, or low on the waist according to the user's preferences. 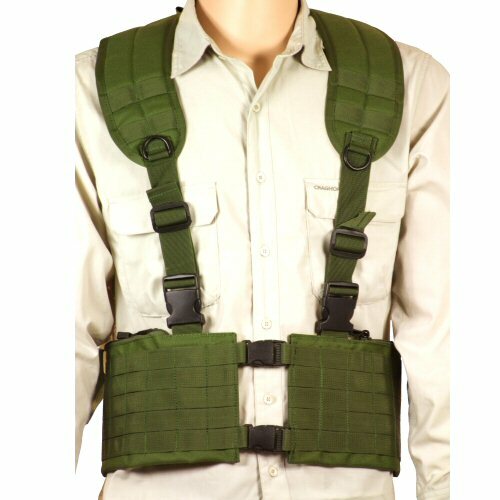 The MLE yoke is provided with a carrying handle for convenience, D-rings over both shoulders front and rear, MOLLE strapping on the upper back and shoulders and a coolmax cushioned support over its entire area. 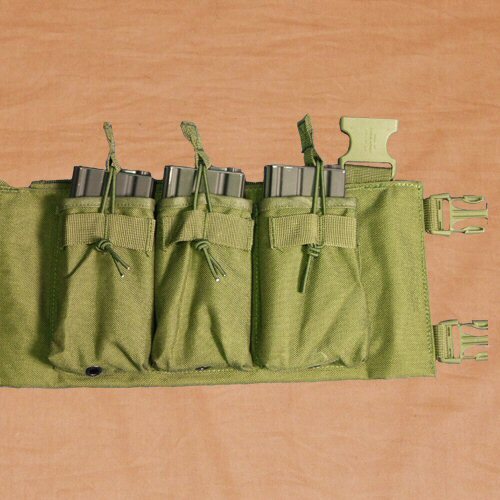 The MLE cumberbund is provided with 5 cross webbing straps for maximum positions on which to mount pouches, a zip open pocket on left and right for utilities, and a further six open pockets (three on left, and three on right) for insertion of foam, extra ammo carrying capability or other utility items. The rear of the cumberbund is provided with an adjustable strap for tightening around the waist or back, and also has a pair of D-rings which can support an additional optional utility strap for comfort or for supporting the bottom half of a hydration carrier. 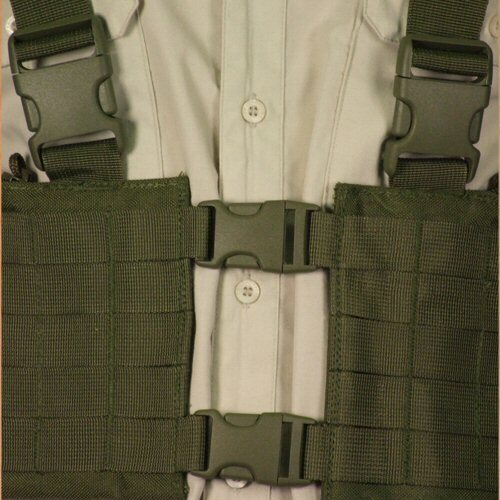 The MLE harness is designed to be opened easily via the two clips on the front of the cumberbund, and the two clips attaching the yoke to the cumberbund. 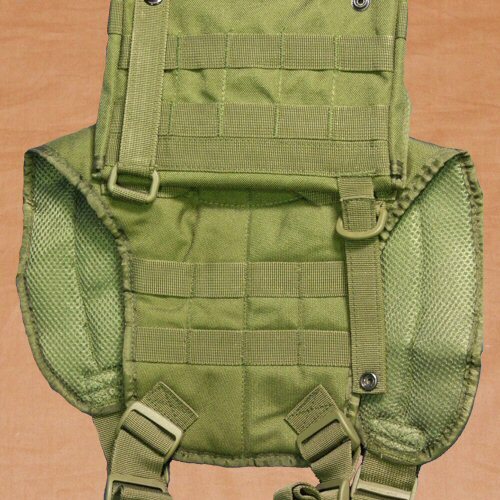 The MLE harness is one of the most versatile MOLLE rigs available in the Bulle range, and its low profile enables it to be worn on its own or over body armour as a quick way of carrying hot-swapping different types of loads if required. 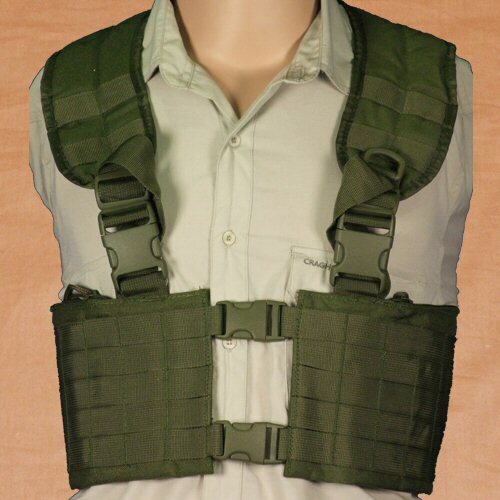 The MLE harness is designed to also act as a stand alone chest rig. Here the MLE has been adjusted to fit across the chest and still give access to the magazine pouches located inside. Closeup of the front buckles. The rig can be quickly release if caught, and makes adjustment over the shoulders and sides easier. Front of the yoke with a pouch attached for extra storage space. Pouch sold separately. Detailed view of upper rear part of shoulder harness. Hydration carrier attached to D-rings not included. Detail view of the inner section of the MLE, with 3 single magazine pouches and retaining elastic.